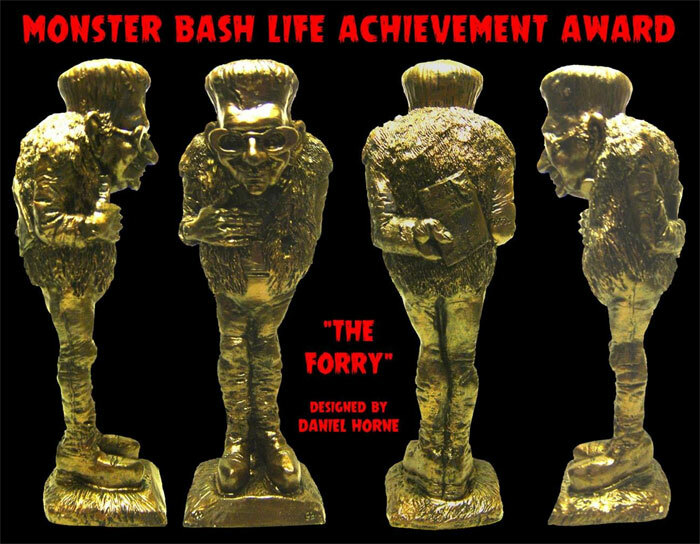 The Monster Bash Award - "The Forry"
Only two lifetime "Monster Bash Award" are presented once a year. The MBA represents a lifetime achievement of fostering the love of classic movies. Preserving the popularity of the films, and preserving the memories of the actors that brought them to us. Two people who have helped keep the genre alive, once a year, will be awarded the MBA - "The Forry!" 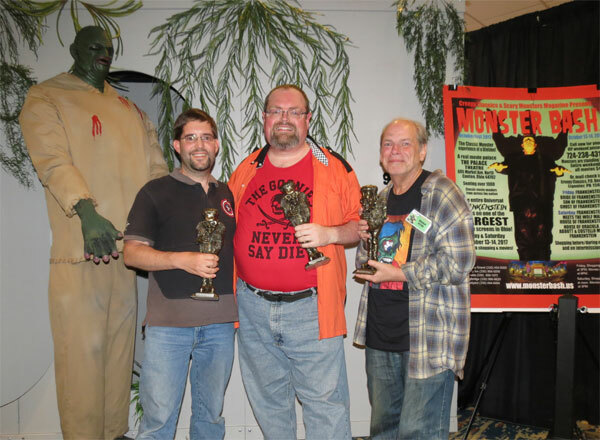 Awards are presented annually at the Monster Bash Classic Movie Conference & Film Festival. Above image put together by recipient George Chastain. Above: Daniel Horne and Forrst J Ackerman. 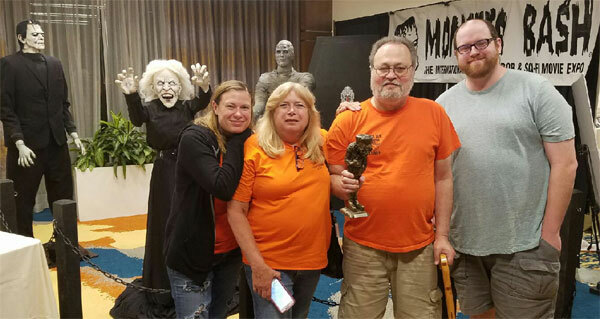 The concept by Ron Adams (Monster Bash Program Director) was a figure to represent the epitome of the love of the classic horror and science fiction film genre. What better way than to have Forrest J Ackeman's image represent that. Forrest Ackerman created a bond in the 1960s and 1970s of the fans of these films of fantasy. 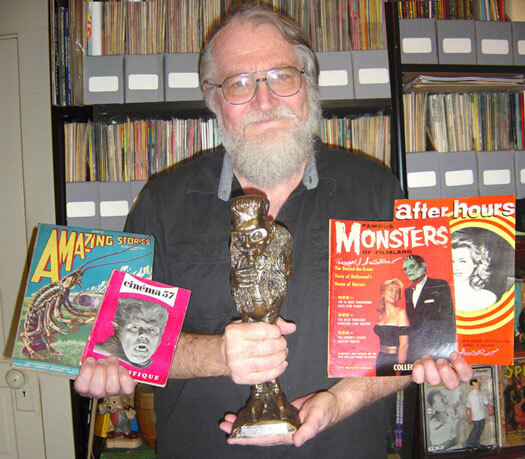 Through Famous Monsters Magazine in that period of time, he brought the concepts of preserving, collecting, and sharing classic movies to the table. The concept of Forry Ackerman and Frankenstein was given to Daniel Horne. Daniel ran with the idea...tying in a bit of Jack Davis' Frankenstein from the back pages of Famous Monsters in the 1960s and 1970s with Forrest Ackerman...creating a sculpture that has become the Monster Bash Award -- a symbol of a lifetime of preserving classic horror and science fiction films for the ages. Only two of these will be given per year...to very special people who have made a difference in keeping these movies alive. It was with great pride that we presented the very first "Forry" to.....Forry. 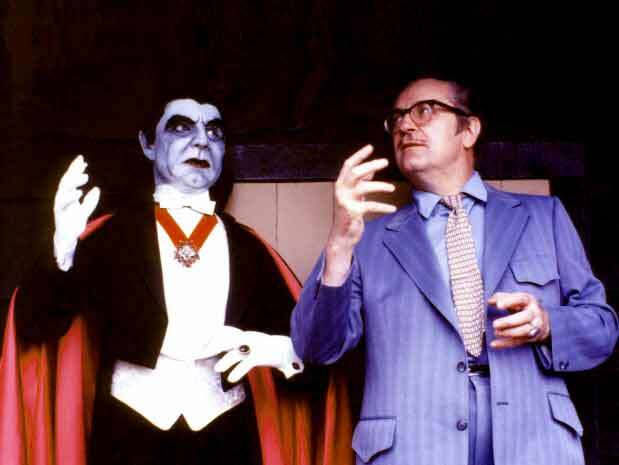 Forrest J Ackerman, as stated above, was the catalyst for a movement that had incredible impact. The preservation, the awareness, the bonding, and the sharing of love for these classic movies. Enough can't be said about this man's achievements in his lifetime. He brought us all together before the Internet. No easy task. It wasn't just about monsters, it was about the people who made the movies, the collecting, the preserving and the transference of knowledge about a time that was special. Thank you Forrest J Ackerman. A name that might not be familiar world wide. But, a man who has spent a lifetime caring about the genre. 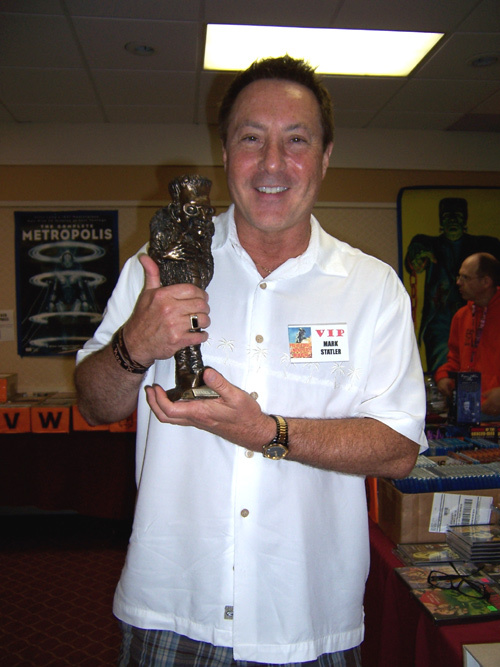 His impact came in being an instrumental component in the Monster Bash classic film conventions. A series of conventions that has solidified the popularity of the genre movies of the silent era through the 1960s in today's awareness. (Our job will be to continue this awareness). 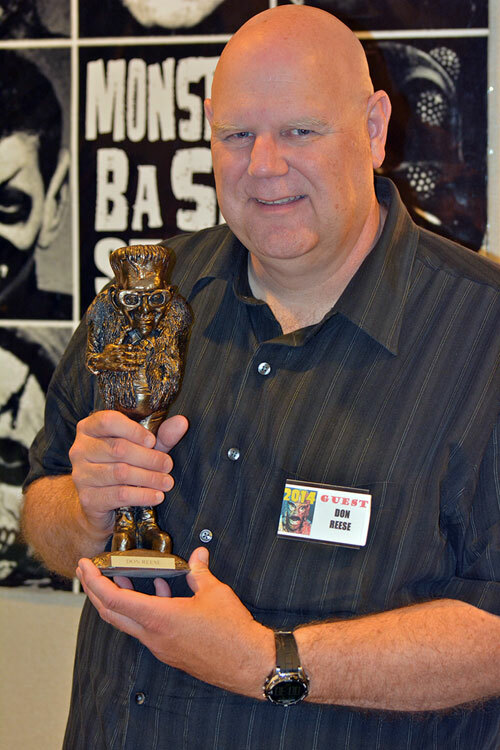 Without Bob, the Monster Bash Classic Movie Conferences would not have been as solid, or as far-reaching. His amazing, unfaltering, perserverence has made Monster Bash something special. Richard Gordon, film producer of FIEND WITHOUT A FACE, THE HAUNTED STRANGLER, CORRIDORS OF BLOOD and so many more. He's worked with Boris Karloff, Bela Lugosi, Peter Cushing, Christopher Lee...But, it's not just for the wonderful genre films that he brought us that he deseves this lifetime award, But, because he's a true fan of the genre and has helped keep the spirit alive for the ages. The Monster Bash thanks Richard Gordon - movie producer and fan of the films we love. When there was no Famous Monsters magazine back after Jim Warren's magazine dwindled away...there was Dennis Druktenis. Not about to let the "Monster Magazine" die out....here came Scary Monsters. For this we are forever grateful. Dennis preserved the monster magazine, kept it coming, and added his own spin of a truly fan based media. Then in 1997 he took Monster Bash to heart and helped the new meeting place of monster fans as an advertising sponsor. The audience was right and Dennis has been such a great help and great friend to Monster Bash. 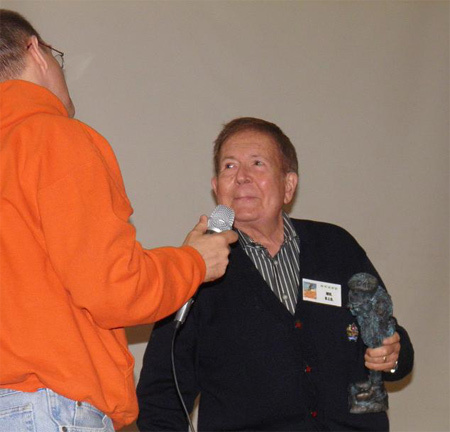 He is honored always with the Monster Bash Award - The Forry. Beginning in 2007, spot-on Jack Pierce male-ups returned to public view at the first Monster Bash conference. There was the Frankenstein Monster, The Wolf Man. The Phantom of the Opera, The Mummy, and they went on from their encompassing all kinds of classic monster make-ups. These were all done at the hands of Ron Chamberlain. His love for Lon Chaney Sr. and Jack Pierce a driving force. In 2000 he won the Turner Classics Make-Up Award for his Hunchback of Notre Dame that he did on himself for Monster Bash 2000. 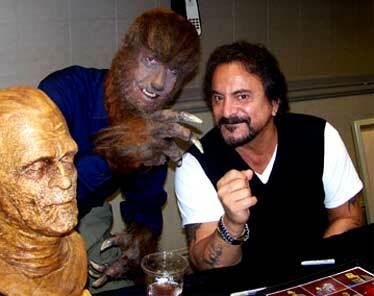 He has inspired and excited a new generation for the classic movie monsters and make-up. 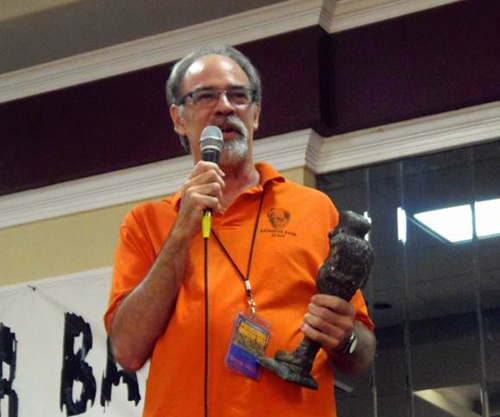 Ron Chamberlain - a true winner in every sense - of The Monster Bash Award, The Forry. There are only a few monster magazines that truly care and focus on the classic horror and science fiction films. One of them is MONSTER FROM THE VAULT - the lobor of love from Jim Clatterbaugh. And, it's done in first class fashion. Jim's dedication and love for these films pours from the pages. Even more inportantly, it pours into the hands and vision of others. He truly lifts the genre up and presents new historical facts and information. Not only preserving, but exciting others. His passion is passed on and will continue to do so. Jim really fits the bill with keeping these movies alive, fresh, and lasting. 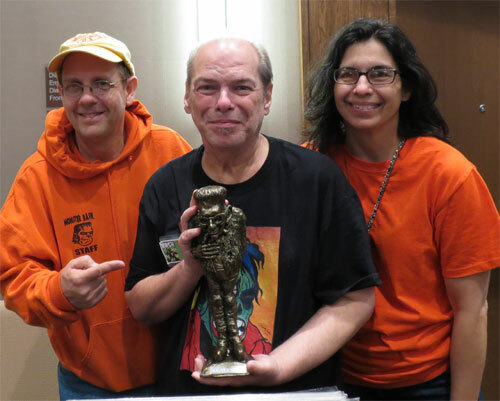 Jim Clatterbaugh, a friend to classic monster fans across the planet - we salute you with The Monster Bash Award - The Forry. There are some people that you might not have heard of. People that work behind-the-scenes. It's time to look behind-the-scenes and give credit to where credit is due. 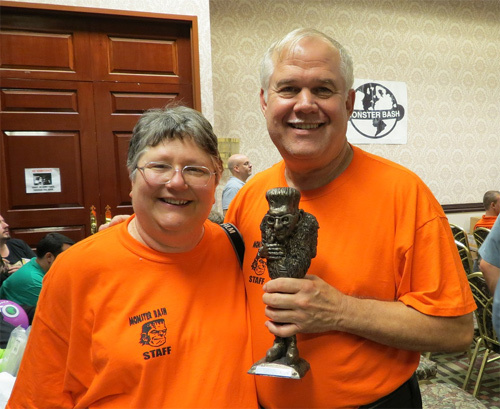 Barb Heiss has worked endless hours, sacrificed many weekends every year, traveled up and down the east coast and mid-west all to help make the Monster Bash Conferences a success. She's the only person I know to have two monster magazines deicated to her: The Famouis Monsters issue she's holding above and an issue of Monster Bash magazine. Her selflessness puts her in that very lmited catagory of true friends of all classic horror and science fiction fans whether they know it or not. Helping send thousand, I mean thousand and thousands, of information flyers out to fans, developing ideas, and inspiring through sheer care and love of the genre. You know her now! 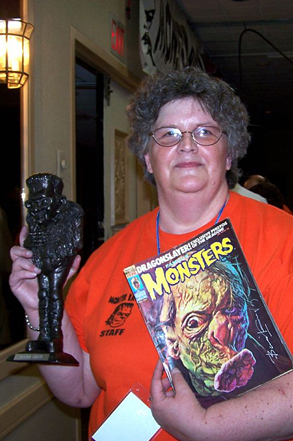 She's Barb Heiss and a force behind the Monster Bash Classic Monster Fest and the preservation of the movies. This surprise Forry was for you Barb. 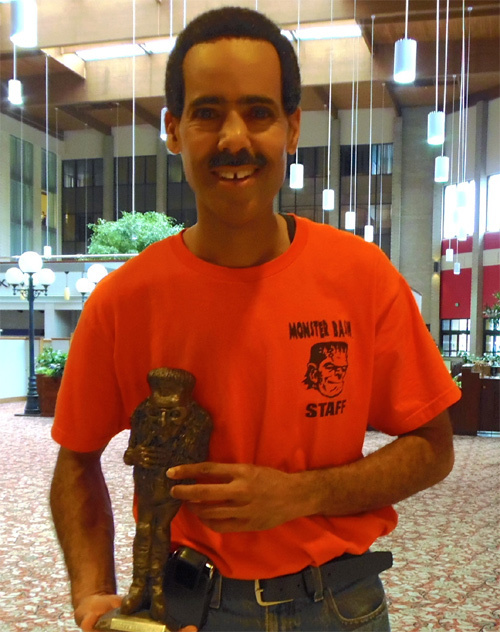 Dear Rondo, I wanted to thank you again for the MONSTER BASH AWARD ("The Forry") given to Michael. 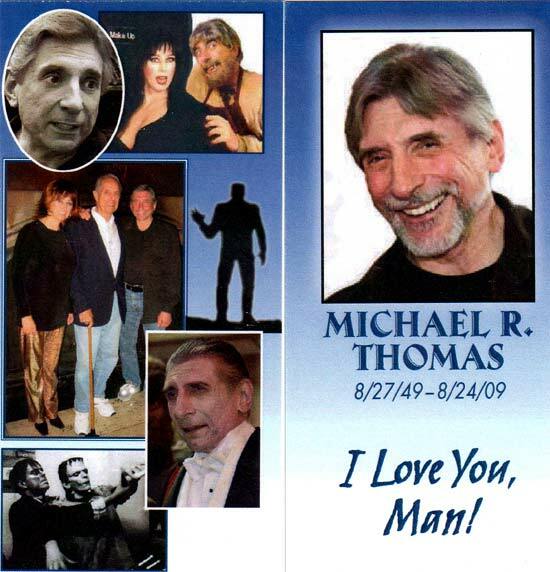 It looks great on the bookshelf below the photos of Michael as Bela the Gypsy. As I must have told you, Michael always loved going to the Bash. It was his family he was seeing. They completed his sentences, knew all his characters. He could run around and was glad to see the families with their little monsters who loved seeing Ygor. These were the happy days that I'll think about. I miss seeing everyone and I know in my heart that whenever there is a Monster Bash, Michael's spirit will be there! Love to you, Ursula and Paisley. This guy has brought more people in the genre of classic monsters than anyone I've ever known, except for Forrest J Ackerman. 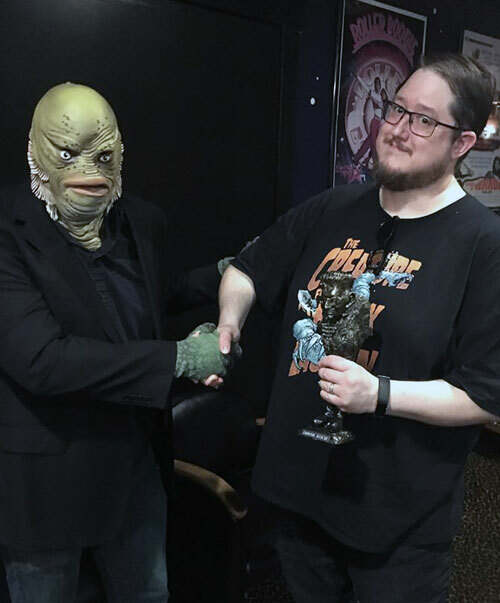 Kevin is easy going and modest, almost seeming embarrassed by the fact that he has connected so many people that love the classic monster movies. I refer to him as the Monster World's Jimmy Stewart from IT'S A WONDERFUL LIFE. 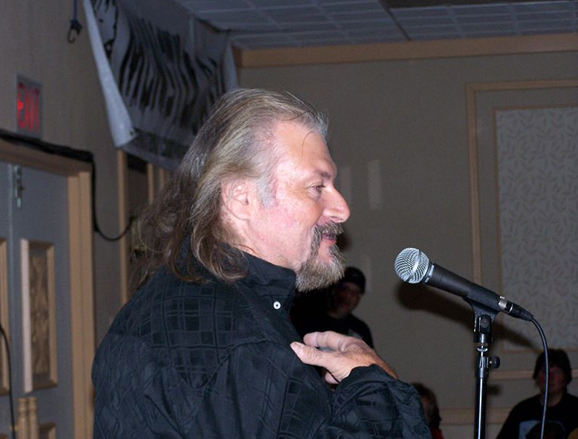 He started the CHILLER THEATRE EXPO just outside of New York City, in New Jersey. 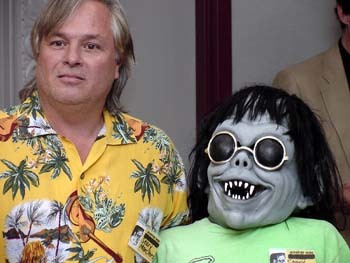 His show has grown and he has connected so many people that have started their own shows, helped so many meet their childhood idols, enabled people to reclaim just a little touch of their youth, and spread the love of monster movies, exponentially through the entire United States. He has done this. Thank you Kevin, this MBA's for you. 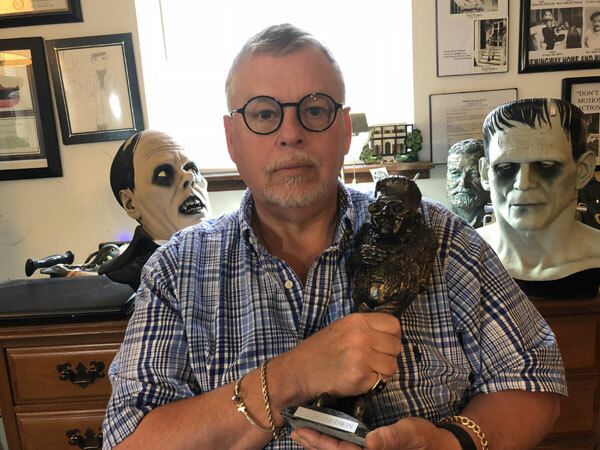 Beginning when he was only a teenager, Cortlandt Hull had ideas on preserving the memories of these classic movie monsters that we love. 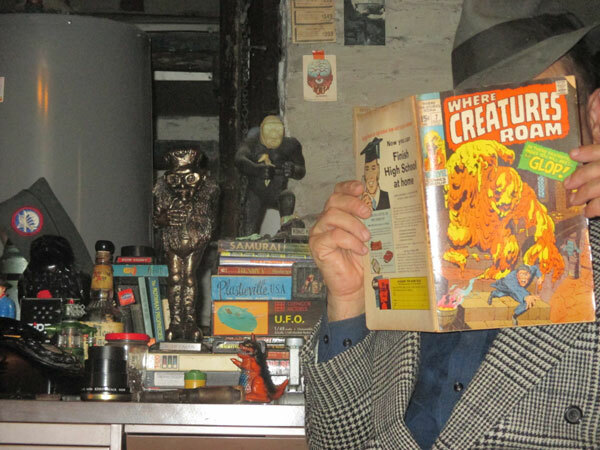 Like us, he was reading Famous Monsters ad watching movies and collecting. But he stepped it up gear, to try to take the genre he loved and get it out their for the general public and to keep awareness of these great films going. 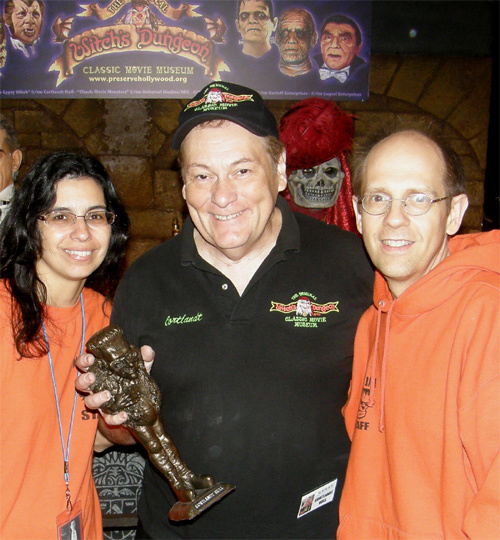 He created The Witch's Dungeon movie museum in Bristol, Connecticut. Open every October to the public, he's been exciting fans and keep the monsters alive for decades. He's now branched into high quality documentaries focused on the classic movie monsters too. He always says that it's just in his blood. His great Uncle was Henry Hull (WEREWOLF OF LONDON) and his great aunt, Josephine Hull (ARSENIC AND OLD LACE). Cortlandt has spent a lifetime keeping the monsters alive. Our applause and a distant, but distinct, howl from London commend you, Cortlandt. Mike Adams is one of us. A kid from the 1970s that grew up with this whole ball of pop culture wax. 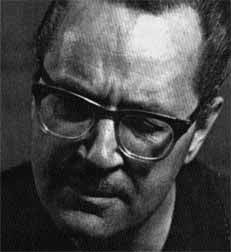 Movie monsters, Warner Brothers cartoons, MPC monster figures, the Aurora models, Jack Kirby and Stan Lee comic books, Forry Ackerman....But, without him, the Monster Bash Conference itself would never have had the initial fire to burn through the years. A quiet, unassuming guy (with a wicked sense of humor) that is an unsung hero. He's one of the engines that lifts the conference above just an event and makes it something more important. The gathering and friendship of hundred and hundreds of kindred spirits that, as kids, longed to "hang-out" with like-minded friends. They're making up for a lifetime, now at the Monster Bash shows. You have Mike Adams as one of the people that was instrumental and IS instrumental in bring all these people together that have the same love and interests. It's a wonderful life....Michael Adams. I was in the Guthrie Theater in Grove City, Pennsylvania in 1966 for a "Kiddie Matinee." I was seven. On the screen came magic. A genie from a lamp that was just about my age, a princess, a hero, a giant monster cyclops, a dragon, an evil magician and a skeleton with a sword! It was a re-release of THE 7TH VOYAGE OF SINBAD on a giant screen. I didn't know it was a re-release, all I knew was that this was magic. I didn't know at the time that the magic was Ray Harryhausen. My story is like many others, all in their own way. Being captivated with wonder and imagination by a invisible special effects genius, our wizard behind the curtain. Ray Harryhausen made movies that made us what we are. Carving a little island of wonder that would flourish in our minds forever. Ray couldn't be present for our presentation, but his friend Mark Mawston accepted on Ray's behalf with a text message relayed from Ray. 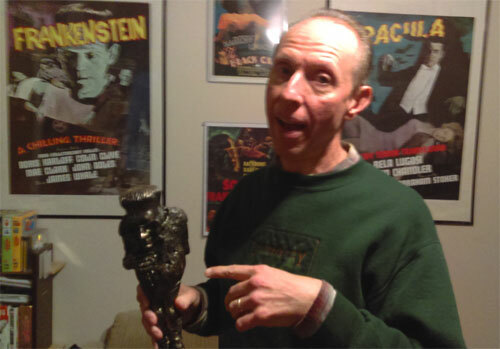 Matt returned to London and hand delivered the Monster Bash Award ("The Forry"). Above is pictured Ray with his "Forry." So fitting that our award is the image of his childhood friend and co-conspirator in delivering the world of wonder to us all. 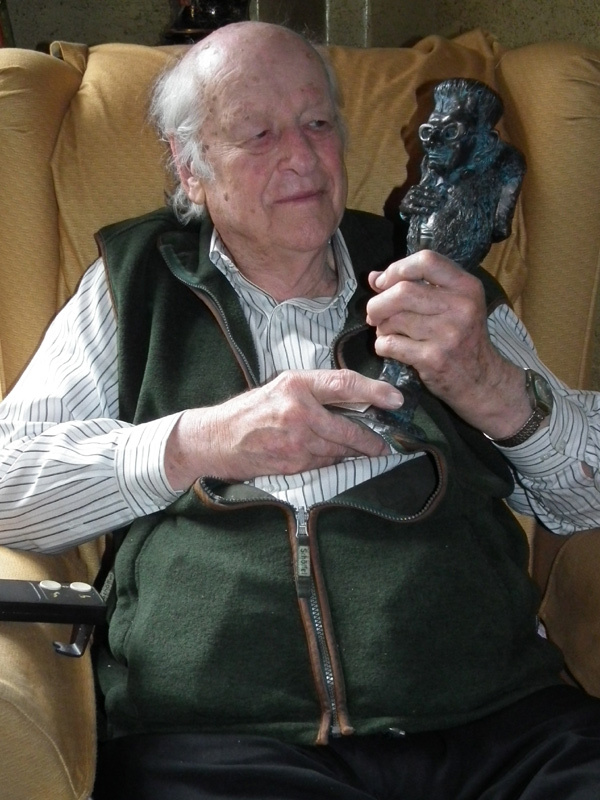 Thank you, Ray Harryhausen - you have made a difference in our lives. Monsters, music, movie stars and Mark Statler Magic. 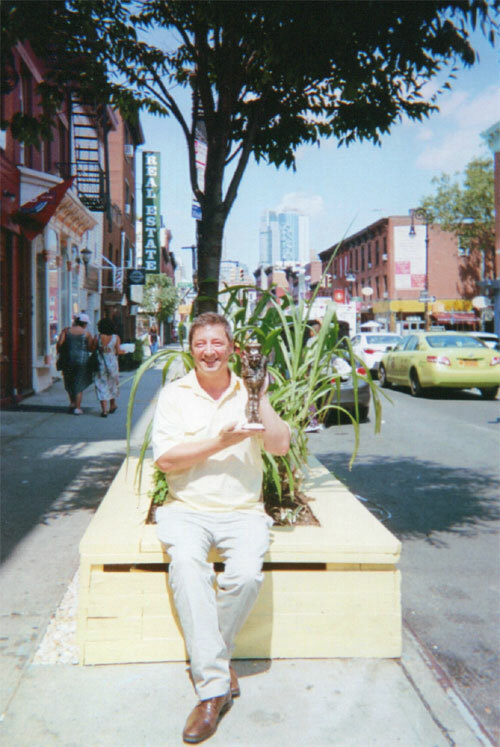 Mark has spent a lifetime in love with pop culture and promoting all the classics films that are dear to us. To hear his soul poured out for the genre, listen to his CD - Mark Statler and His Creepy Classic Chiller Band that he put together with his brother Theron. When you sing songs like "Mystery of the Black Lagoon," you know he's one of us! 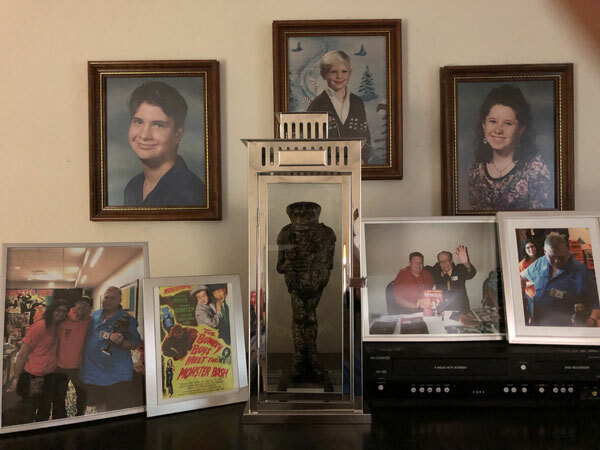 Mark spreads his goodwill and love wherever he goes and is loved, hmself, by many of the film stars...A big heart and a big boost for our Monster Generation - Mark Statler. This goes to the ever deserving man who put BIG monsters on the silver screen for all us kids - Bert I. Gordon. He was nick-named "Mr B.I.G." by Forrest J Ackerman himself. A big man in the genre, a man who's special effects brought us jumbo-sized monsters like THE CYCLOPS, THE SPIDER, THE AMAZING COLOSSAL BEAST, the grasshoppers in BEGINNING OF THE END, KING DINOSAUR, FOOD OF THE GODS, VILLAGE OF THE GIANTS and so many more. Bert is a dear man who has brought that excitement into our lives from the very beginnig. Bert I. Gordon truly is Mr. B.I.G. in our eyes....Forry you were right! A tried and true blue monster kid. 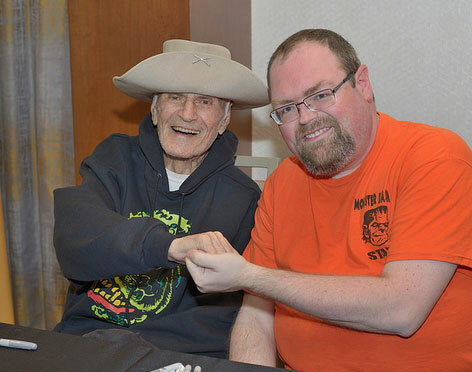 He grew up reading Famous Monsters magazine, watching classic Universal movies, catching the CBS Late Movie in the early 1970s for the Friday night Hammer showings and just being one of us who got older, but stayed young with his interests. Kevin's also one of those of us who grew up with music mixing with the monsters...branding him at a young age...he's taken it to a whole new level. Not only has been a professional musician, but he has contributed his talents into the world of classic film too with scoring...well, scores of silent films, creating monster pop/rock songs and performing "Monster Bash Happenings" with a merging of his talents. Kevin Slick makes our Monster World just that much more fun, thank you Kevin. 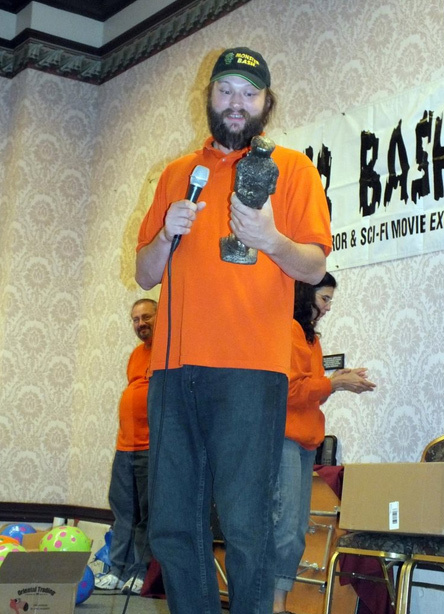 The MONSTER BASH AWARD ("The Forry") is not just for mainstream movie makers and writers. It's for everyone who supports classic movies of imagination, horror and science fiction. Keeping classic monsters movies of the past alive. It's a struggle as new generations unfold. New media, and sometimes impatience for black and white film, non-widescreen presentations, scratchy prints and story development that may unfold too slowly for a fast and furious younger generation can make it difficult. But, it's the people who have created and try that this award is for. And, it can come in many different ways. Everyone is unique. Our people have their own unique ways of keeping the monsters alive. David "The Rock" Nelson is one of them. And, maybe the most unique. For sheer promotional muscle, I can't think of anyone more deserving. He makes movies himself, and whether you like his movies or not. Whether you think he's too abrasive in his talks or salesmanship. It's hard to think of anyone who loves the old classics and reminds you about "monster movies" more. David is a super-powered media maniac. Everyday of my life, unsolicited, I am reminded about monster movies by David Nelson in some way. He uses every media to, with tiring, talk monsters. For these efforts alone, our hats off to you David Nelson, for being the angry villager that holds the torch up, not to kill the monsters, but to keep them alive. 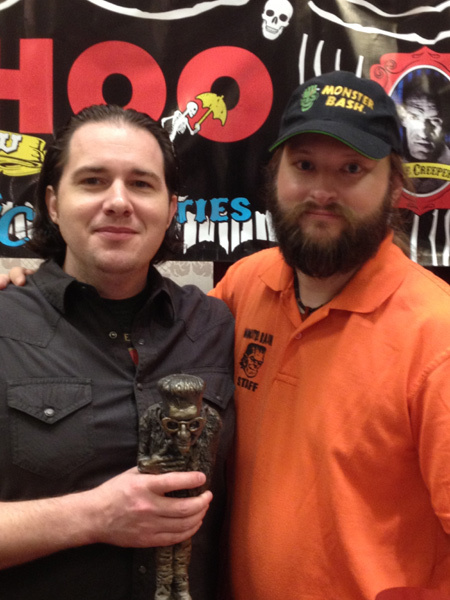 Above: Daniel Griffith with Monster Bash's Dan Weber. (Photo by Theron Statler). 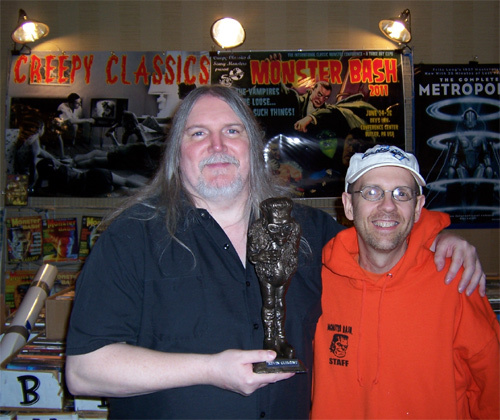 I met Daniel Griffith at a Monster Bash quite a few years ago. He was just a young guy making a documentary on K. Gordon Murray films that played the matinee circuit back in the 1960s. I thought, wow, this guy's really enthusiastic about such a cool subject THAT I remembered, but was before his time. His love and enthusiasm (and wry sense of humor) poured through on MANY documentaries that were to come. His attention to detail, and quality of work is so apparent in his work that will forever help preserve the historical importance of the films and pop culture associated with them. 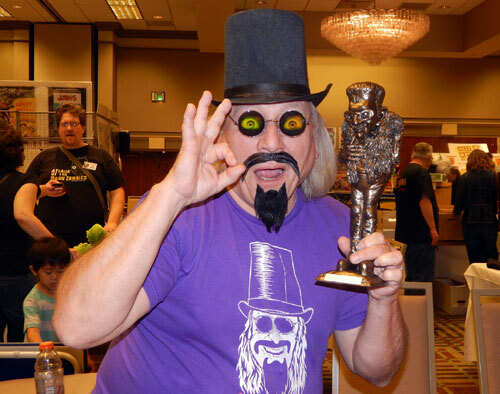 With a huge tip-of-the-hat, Daniel Griffith - Monster Bash Award winner 2013. 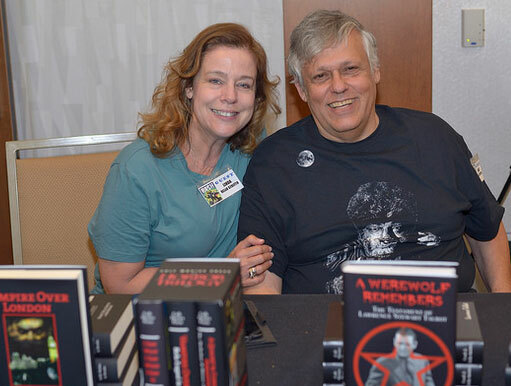 Above: Anna Marie and her husband Charles Henson at Monster Bash 2013. Charles is the videographer for Bash and an amazing film archiver...preserving the history of our beloved movies and television performances. An unassuming master of video and writer. You'll see him at Bash always with video cameras and tripods not far away. His personal archive of film and television appearances of all our favorite actors numbers in the tens of thousands. Besides creating an amazing reference library, recoding the Monster Bash shows for posterity....he has, of recent years, embarked on making documentaries on the lesser known character actors that we all enjoy. His extensive research is simply amazing. He produces them along with his wife, Anna Marie, narrating. 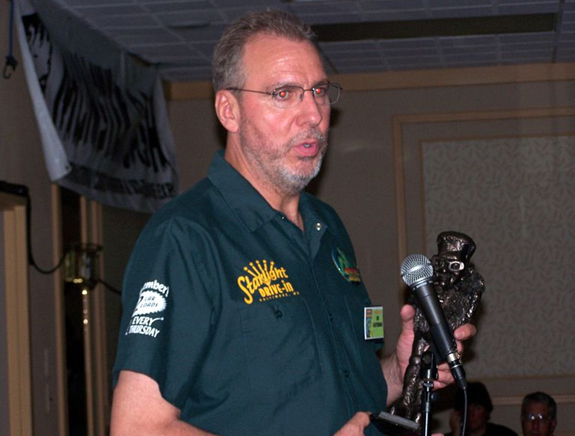 Amazing work, amazing man...a Monster Bash Award well-deserved. One of the biggest 16mm film collectors in the USA, it's Geoffrey Curtis, who has preserved and collected classic monster film over the years. He's dedicated years and care to keeping the soft clicking and clacking of real film screenings going to classic film fans. 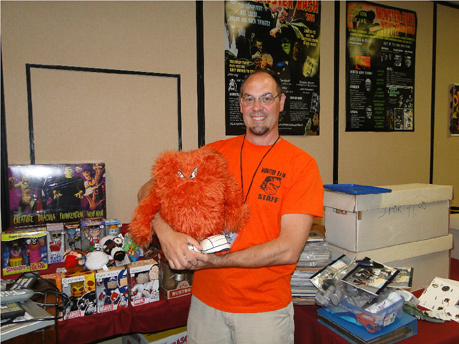 A tuly wonderful man who serves up movies at Monster Bash and other film conventions. He's one of a kind with a big heart, a love for movies and always ready to flash a smile, bringing good vibes wherever he goes. 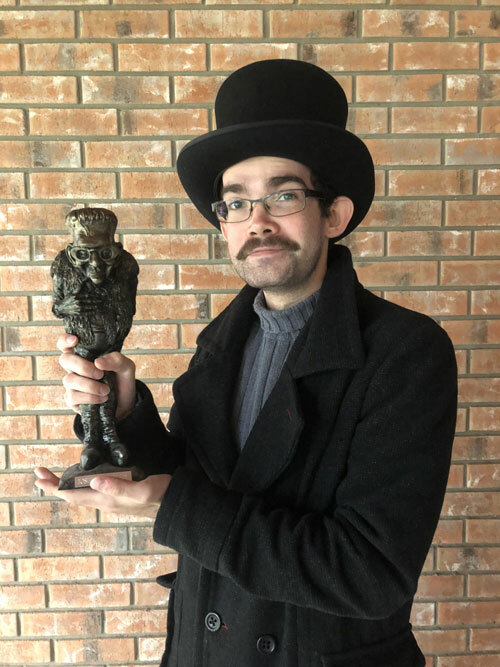 Our sincere applause to Geoffrey for being Monster Bash's film man! (Photo courtesy of Anna Marie Henson). While too young to be an original Monster Kid from the Monster Boom Generation, he's a second generation kid. One that goes wy above and beyond. Investing much time, skill and smiles to keep the love for classic monsters going and bridging into today's third generation Monster Kids. 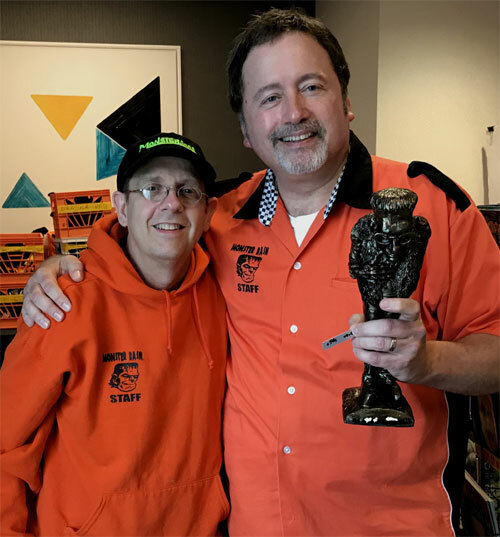 Dan has spent tireless (well maybe not ALL tireless) hours helping make the Monster Bash Conventions come together with hands-on craft, driving, promoting and finding out all about what it means to all of us...preserving these films we all love. Thank you, Dan Weber. (Photo courtesy of Marian Owens-Clatterbaugh). This guy is the epitome of the Monster Kid! He grew up watching monster movies and has kept it going by inspiring his daughters with monster movies and love. He made his own "Home Made Monster Movies" through all the years of his kids growing up. 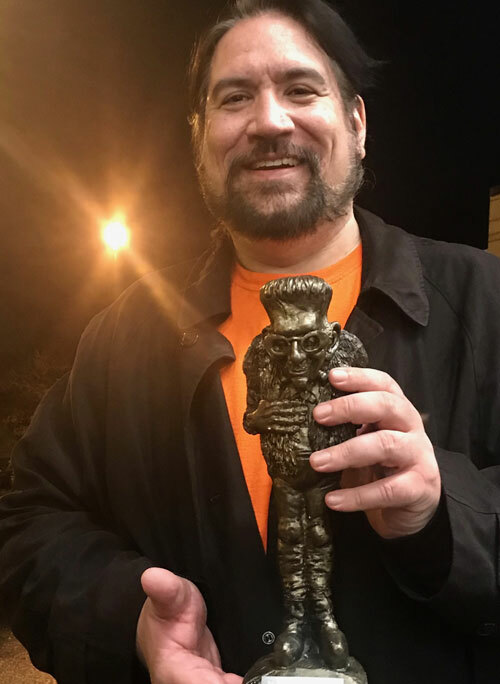 Brian would have them screened at MONSTER BASH and has touched and inspired others to do things with their kids and to keep the love for "fun" monster movies alive. Decades on broadcast television as one of the longest running TV Horror Hosts, Keven Scarpino (aka: Son of Ghoul) has touched thousands of viewers and all he meets with a love of growing up with monster movies....He's made it fun with a wild sense of humor that is rooted in a strong hope to keep memory making alive. Keven is also inspiring us first generation Monster Kids never to forget. A woman who has brought Renaissance quality and style....to classic monster movies! 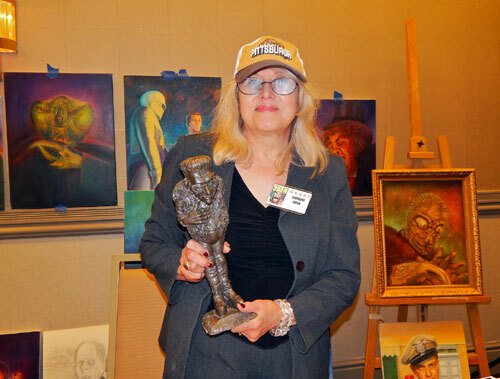 Lorraine Bush is such a fine talent and has had many of her pieces of truly fine art (in every sense) to the covers of MONSTER BASH magazine and on private commissions. She never fails to totally capture the essence and spirit of the monsters and the actors that shine behind the make-up. She captures it all and makes the images we love fresh and exciting. A big guy, abigger heart. Don Reese is a stand-up comedian.....one that grew up in the Monster Boom Generation and totally is able to twist his keen observations that both make us laugh, think and remember our own childhood. All with a smile, and more imortantly bringing smiles of joy to all those in his audience. This guy can tie Forrest J Ackerman, Stan Lee, comic books, vampires and sci-fi character actors (like Whit Bissell) into a comedy routine that will, literally, leave you in tears. And your not sure if the tears are from laughter or that longing for those things you love in childhood. It's a sincere, special talent. Thank you, Don. This guy has probably created more photo opportunities with classic monsters than anyone around. 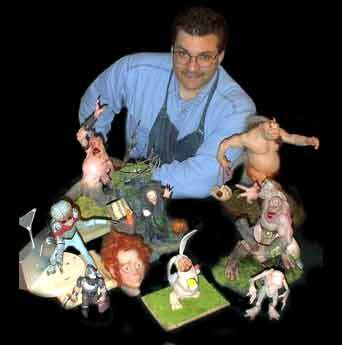 Jerry creatues life size figures of the monstes and displays them for fans from across America at the MONSSTER BASH conferences and in Indiana where he wows hundreds every Halloween season. With the support of his family he houses monsters that he brings to our world. On behalf of a million fans who have snapped photos to remember the monsters..."thank you!" Deborah Painter is a lifelong monster movie fan and writer. She's the one who brough us the book on Forrest J Ackerman: FORRY! 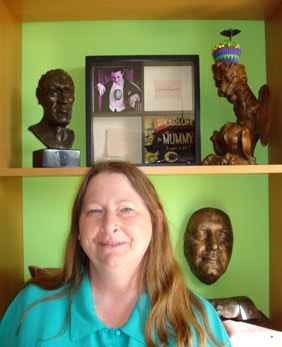 She has written numerous articles on the subject of classic monsters and frequently gives talks at the MONSTER BASH CONFERENCES. An amazing actor/writer/performer who embodies the spirit of Edgar Allan Poe and Vincent Price. He performs stage plays based on classic horror short stories and astounds all with his abilities to breath life into words. A deserving spirit who shares his talents with all. The biggest "man of mystery" in our Monster Bash Awardees. He has written numerous articles that enlighten and revere the genre. M. Oleman never lets us forget our roots. A "Kingpin" of Monster Kids, whether he'd admit or not. Look for his writing that strike a chord with all of us in Monster Bash Magazine and on various web sites across the web. 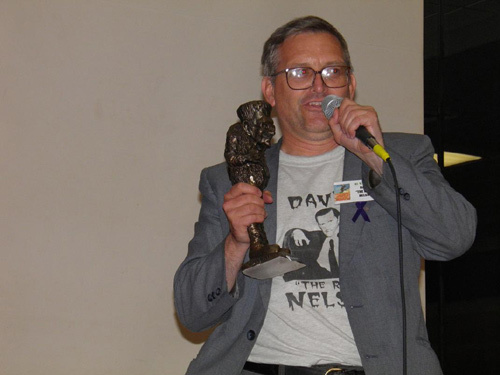 See "Tales of the Moleman" by M. Oleman by clicking here. For decades this man has created an underground Forrest J Ackermansion east! One of the greatest collector's of classic film and one of the greatest artists to grace the genre. 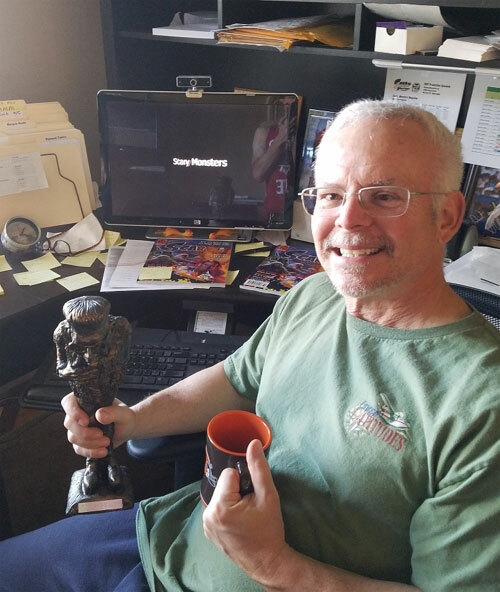 His bubbling enthusiasm for the strange, weird and wonderful pop culture of the past elevates him as a very deserving recipient of the MONSTER BASH LIFETIME ACHIEVEMENT AWARD. His list of credits could scroll for miles. 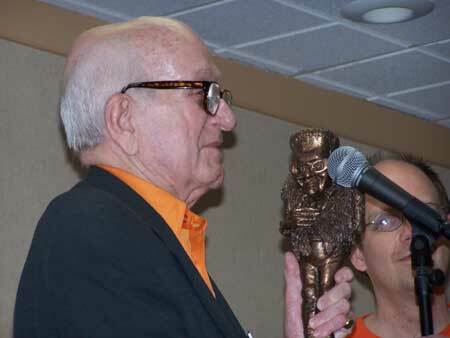 Forrest J Ackerman would be proud to stand side-by side with George E-Gor" Chastain. This Forry's for you, George. He grew up in Pittsburgh and has worked in motion pictures for decades as a mak-up man, special effects creator, director and actor. A Reneaissance man in the world of the horror film. From FRIDAY THE 13th to NIGHT OF THE LIVING DEAD to TALES FROM THE DARKSIDE to CREEPSHOW to....MONSTER BASH. Tom has been at almost every MONSER BASH for 20 years. A supporter of classic monster films and a man of action. Above: Acror Lary Storch with Leonard Hayhurst (right). From the early days of the MONSTER BASH Leonard Hayhurst has been instrumental in creativity and designing concepts to make classic monster films fun and topical. He currently has redeveloped the "Midnight Spook Shpw" concept for MONSTER BASH. He's been with us through thick and thin promotion MONSTER BASH and our brand of pop culture all over the east coast and mid-west. A deserving trooper the adds special magic to all he does. Above: Award winners in 2017 - Martin Grams, Leoard Hayhurst and Malcolm Gittins. Decades older than he really is. Martin has spent his life perserving classic movies, classic pop culture, classic TV, classic radio drama and written books on it. 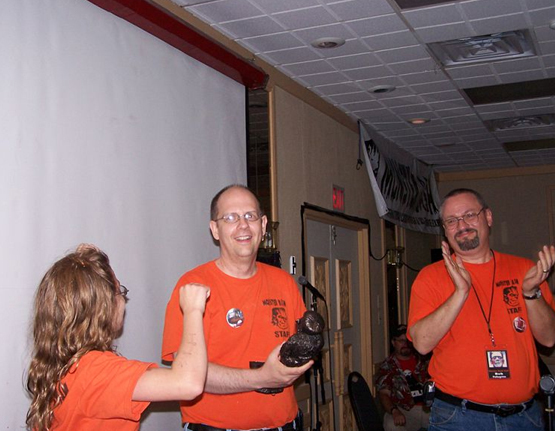 He's developed the MID-ATLANTIC NOSTAGIA CONVENTION and has supported MONSTER BASH for years. He has left his mark for future generations to relive the pop culture of yesterday. Above: Linda and Frank Dello Stritto. Typing words is his life. Not just any words, but prose that will keep alive Bela Lugosi, classic horror movies and the 20th century's legacy of horror and science fiction films. The author of VAMPIRE OVER LONDON, A QUAINT AND CURIOUS VOLUME OF FORGOTTEN LORE, I SAW WHAT I SAW WHEN I SAW IT and A WEREWOLF REMEBERS. Frank makes learning about classic horror films fun and interesting. His books reflect that and so do his talks at the MONSTER BASH CONFERENCES. An incredible researcher with a sense of humor. Above: Ron Adams and Ursula Adams present Malcolm with his MONSTER BASH LIFETIME AWARD. Malcolm front and center. Malcolm Gittins embodies what is the true spirit of a "Monster Kid!" He grew up with Pittsburgh's CHILLER THEATER, FAMOUS MONSTERS OF FILMLAND magazine and loving these movies. What makes him so special is that this spirit is shared with unbelieveable enthusiasm through art, writing, photography and in every sentence he speaks. Thanks to Malcolm for NOT letting us forget how much our upbringing with classic monsters means. Scott has spent a lifetime of collecting knowledge AND sharing it with others on classic horror and science fiction films. Always quick to help with trivia and history of the films. He's become an instrumental interviewer in the MONSTER BASH conferences with his friendly demeanor and reveling knowledge when talking to actors and actresses. Three cheers for a great guy who documents the films we love with all he meets. Writer, and super Monster Kid who grew up with monster movies and continues to promote them with all he meets. 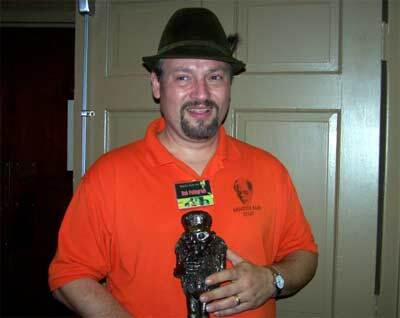 Jerry is a Pennsylvania native and has authored the book "Full Moon Curse." The book itself takes place at Monster Bash, the conference. Jerry is one of the nicest guys out there and it's completely knowledgeable on the classics. Jerry holds the torch. Below is a photo of the Monster Bash program guide framed, and then the award itself in its display case. This followed by a photo from years ago taken of me with Uncle Forry and finally a picture Diane Mazirczak snapped at the moment your dear wife surprised me with the MBA. 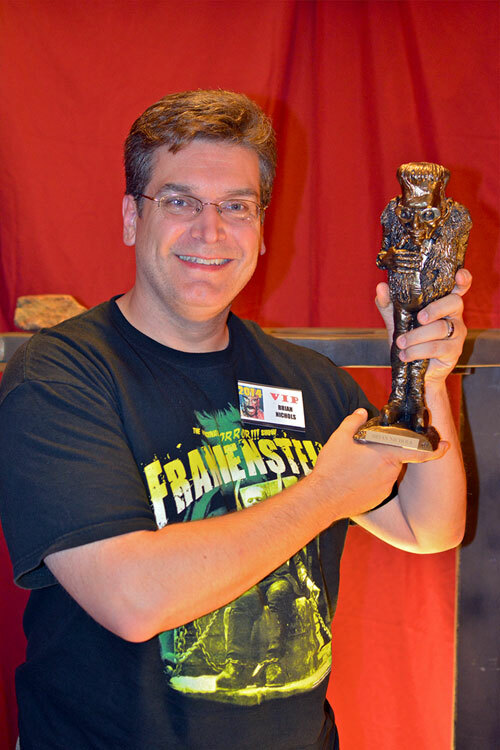 One of the nicest guys promoting classic monsters on this planet (a few others too, maybe!). Derek runs the fun, informative and loving podcast MONSTER KID RADIO...reaching fans all over the world with the good news on monster movies, monster movie fans, film actors, writers and everything that is great about the genre. Pleaes stand with me to appreciate Derek Koch, Monster Kid through and through. Steve is a writer, musician and lifelong monster movie fan! You can read his insightful and fun articles in MONSTERS FROM THE VAULT and MONSTER BASH magazines. You can see Steve perform at the MONSTER BASH CONFERENCES in the house band...he plays one mean lead guitar. Three, make it four, cheers for Steve Thornton! A long history of monster pop culture wax is the make-up of this Monster Boom Generation kid. John's been a writer, radio announcer for a movie talk show, interviewer of actors and actresses. A walking encyclopedia of monster and cult movies and TV. If you ever have a chance to speak with John, you'll find him capable of talking all angles of horror and science fiction films. He grew up in Ohio, moved to California with the heart of a Monster Kid. Picking up where Dennis Druktenis left off, Don now is the editor of fan favorite magazine SCARY MONSTERS! The magazines and monster love keep coming! As a kid the movie THE GORGON fascinated him....he went to school for film, all the while making his own movies. He is the epitome of the doer, making scores of films and getting them distributed when he was still a teenager. Now he's working with classic Hammer Film actors and actresses. A wicked sense of humor and a load of talent, Joshua Kennedy is keeping the fun of classic horror and science fiction movies alive. In the meantime, join us at the very NEXT show, CLICK HERE for more!